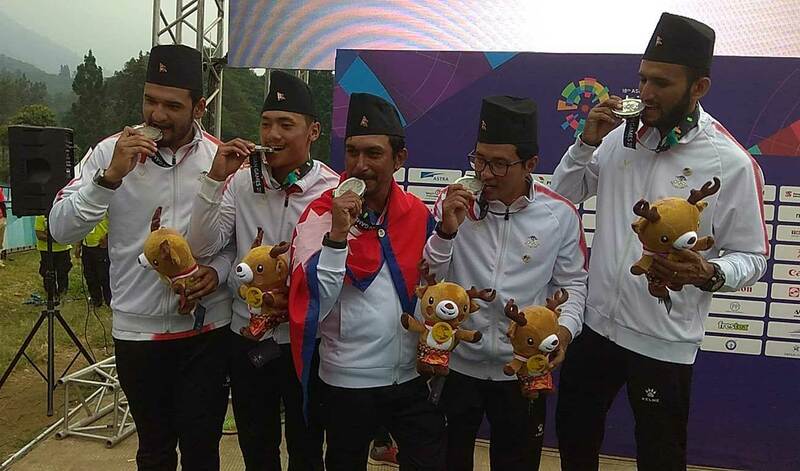 KATHMANDU, Aug 29: The Nepali team contesting in the last round of paragliding of the ongoing 18th ASIAD (Asian Games) in Indonesia has bagged silver medal. With this, Nepal has secured second silver in the 67 years of Asian Games history. First one was clinched by Sabita Rajbhandari in the Games held in Thailand in 1998. It was however in taekwondo she had got the silver. It is the first time that the Nepali team is vying this sport and bagged the silver under men's cross country event of paragliding. The contest was held at Gunung Mas Puncak in West Java of Indonesia today where Japan got gold medal securing 11,391 points. Nepal conceded defeat by 27 points. Nepali paragliding team comprised Bimal Adhikari, Yukesh Gurung, Bijaya Gautam, Sushil Gurung and Bishal Thapa. The 18th edition of Asian Games, regarded as the Olympics of the Asia, is ongoing in Indonesia where a total of 45 Asian countries are contesting in total 40 games. Nepal is competing in different 29 games in this mega event.